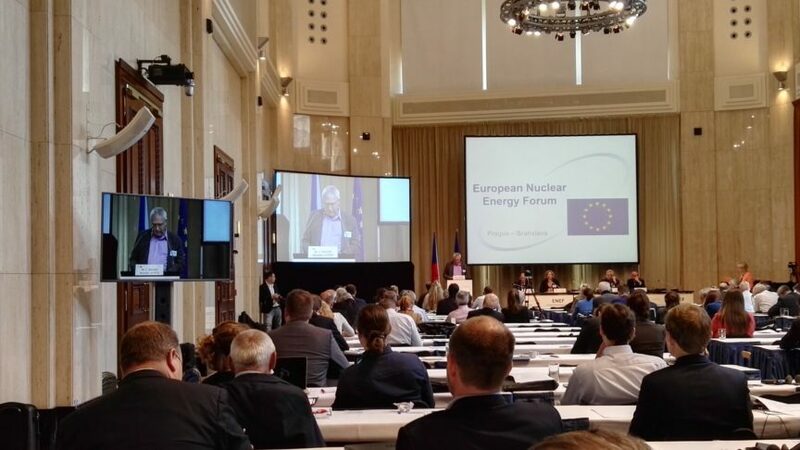 The Chair of our RWM working group Johan Swahn was a panelist in ENEF forum on 22-23 may in Prague. The theme this year was: “60 years of Euratom”. We publish here his presentation. “First of all I would like to thank the European Commission for its efforts to make the ENEF more balanced when it comes to the points of view represented at the meeting. It is really vital that many voices can be heard. The challenges ahead are large as much of Europe is moving ahead and are ending the nuclear energy programmes that were started 60 years or so ago. Some European Member States have not yet come to the understanding that the apparent advantages of nuclear energy, such as low carbon dioxide emissions compared to coal, are countered by many disadvantages compared to strongly expanding renewable energy systems. I have worked with radioactive waste issues for many years, first at university and since 12 years for the Swedish environmental movement. In Sweden the systems set up for access to information, consultation and public information are very favourable for dialogue. It is not always easy to interest the general public or politicians in the complexity of radioactive waste issues, but the interactions between the industry (SKB), the regulator (SSM), the nuclear communities (Östhammar and Oskarshamn), the Swedish Council for Nuclear Waste (the Government’s scientific advisory board), academia, the environmental movement and other actors are well developed. In order to allow strong engagement from an environmental movement that has many priorities and limited resources the Government has since 2004 even resourced them. MKG has for many years, like the nuclear communities, received funding from the Swedish nuclear waste fund. Coming from the Swedish experience, the transparency of European and national radioactive waste management governance is vital from an NGO perspective. In order to achieve successful and safe radioactive waste management it is vital to involve civil society in an open process all the way from early planning through decision-making to implementation. This also means giving environmental NGOs the resources to engage in a strong and sustainable manner. Yesterday, and today, as I listened to speeches, presentations, and sat around the tables in the World Café, two things struck me. The first was positive. I clearly felt that many, but not all, persons I interacted with were willing to listen and take in things that perhaps were new to them. Just as I have learnt that by listening and taking in new information I can come to develop a more informed opinion. But there was also a feeling of travelling back in time. Maybe discussing the “60 Years of Euratom” contributed. I was not there in the 1950s, but it must have been similar. At that time nuclear energy was a new technical possibility, a peaceful atomic age was growing from the nuclear weapons developed during the Second World War. Everything was positive. Radioactive waste was not a problem. Accident risks were seen to have such a low probability that they could be ignored. Routine releases from operational reactors were not worse than the chemicals that were released from other industries. Nuclear power would be cheap and save the world. I had a feeling that was what I also heard many times yesterday. Nuclear has no problems. And it can save the world from climate change. All that has to be done to once again realise the vision of a great future for nuclear energy, is to inform the public, and people like me, so that we will understand. That nuclear energy is not so expensive. And that it does not cause so much release of carbon dioxide. But this is 2017. What if the general public now understands that nuclear energy may not the best way forward? What if they are willing to pay extra to make their energy future a modern one based on renewable energy?I know that some of you have researched and understand how the European and global energy systems are developing. But many of you have not. Knowing many people working in the renewable energy sector I have to say that my impression is that their knowledge of nuclear is much larger than many nuclear enthusiasts’ knowledge of alternatives. But I digress. This panel is about radioactive waste management. On the other hand there is a connection. One clear reason that the general public sees nuclear energy as more problematic than a renewable energy system is that nuclear energy produces waste. And not just any waste. Waste that is highly dangerous to begin with and needs to be isolated from mankind and environment for ten thousand, a hundred thousand or even a million years. In this panel we will among other things discuss the European Commission’s report on the Member States’ implementation of the Spent Fuel and Radioactive Waste Directive. It is a very good report. The Commission has taken a broad perspective on what is happening in Europe. Well worth reading, but also food for thought and for humble reflections. There are many interesting things to discuss after reading the report. Why are there so poor estimates for future waste production? Why are so many Member States still lacking regarding policies, concepts, plans and site selection, especially for high-level radioactive waste? Why do so many Member States have unverifiable systems for paying for waste management and decommissioning of reactors meaning that there is a significant risk that the tax-payer will have to pay for the nuclear industry’s waste? Why do so many member states not have appropriate systems for transparency of information and good public participation processes? For an environmental NGO this last issue is of extra importance. The Commission needs to request clarifications and express its opinion to Member States on the implementation of Article 10 on transparency in the Spent Fuel and Radioactive Waste Directive. The Commission also needs to encourage a broad discussion of transparency in radioactive waste management among the Member States at the European level, as well as continuing to support civil society participation in such discussions. You can find the agenda of the 2017 ENEF meeting here. You can watch again the streaming of the ENEF: here.